This dish combines ready cooked rice and fresh broccoli florets in a creamy, cheesy sauce. You may automatically assume the cheese was cheddar but in fact, Parmesan cheese was used with a touch of Dijon mustard for a little tang and color. For a little but of saltiness, I added some bacon which really took it to another level. Now the original recipe called for chicken, but enjoyed it without and served it with a simple roast chicken instead. Preheat the oven to 350 degrees and place the rice in a baking dish and set aside. 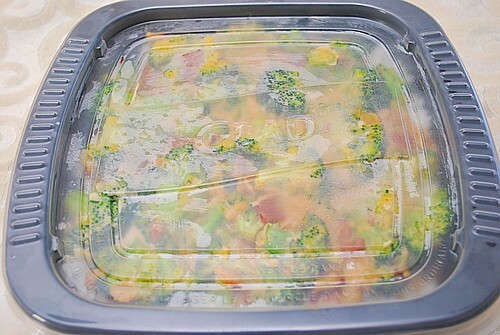 Combine the broccoli and 1/4 cup water in a microwave safe bowl, cover and microwave for 3-5 minutes until tender. Drain broccoli and set aside. Alternately, you could use those package ready broccoli florets that can be microwaved and steamed in the packaging. Melt the butter in a skillet over medium high heat. Add onions and bacon, cooking until they begin to brown. Stir in flour and cook until thoroughly incorporated. Whisk in broth and cream, simmering until thickened. Add the mustard, cheese and the broccoli into the sauce in the skillet. Season with salt and pepper. 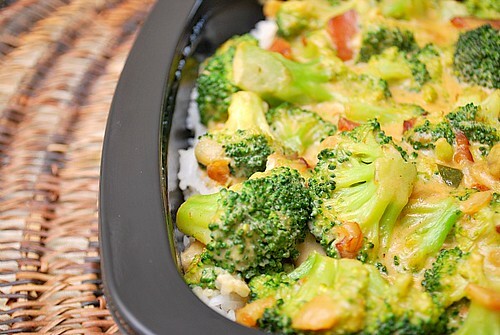 Transfer this broccoli cheese mixture to the prepared baking dish and pour over the rice. Bake in the preheated oven for 10 minutes to warm through and enjoy. Thanks for this recipe! It was a big hit with my son. Made it vegetarian, using cheddar cheese since I did not have parmesan. Yummy! How many people would you say this serves? Hi Christine! As an entree, 4-6 and as a side, 6-8. Does this make an 8x8 casserole size? Also, when making it for the freezer, do you need to increase the cooking time? Thanks! Vanessa, this fit in my 8x8 freezer container perfectly. As for cooking time, I thawed it completely before baking in the oven, which took 10 minutes to heat through. If cooking directly from frozen, you will definitely need to increase the baking time to 30-45 min or more. I suggest thawing in the fridge the morning of the day you wish to serve it and then heat up in time for dinner. Hope this helps!